Living and working in the Central Valley of California provides us with the wonderful benefit of being able to enjoy important personal contacts within the ag equipment industry. Most of the manufacturers of this specialty orchard equipment are located close by so it's easy to stay in touch by attending key farm shows or even dropping in on manufacturers as we travel through the area on appraisal business or holiday. Our office maintains a compressive and up-to-date database of key orchard and vineyard contacts. I first met many of these folks years ago when I performed several sizable orchard equipment auctions and I've continued to cultivate and expand a network of orchard and vineyard industry contacts. 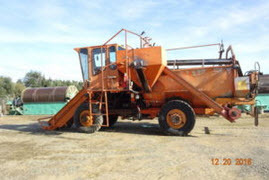 Some of the unique orchard equipment types we've enjoyed appraising are orchard shakers, sweepers, harvesters, material handlers, shredders and sprayers, many manufactured by local companies: Weiss McNair, Exact, COE, OMC, Nelson, Thomas, Kingsburg, Jack Rabbit, weldcraft and, of course, Flory. The depth and breadth of our experience with orchard and vineyard valuation produce valuation reports that courts trust. We've been following diesel tier 4 technology and the harvesting revolution, two of the biggest developments in the orchard equipment world. Many manufacturers are having trouble making the transition to implementation of the tier 4 final diesel engine. That certainly has an influence on values of diesel equipment. Transitions to optical technology that enables increased precision in sorting, shaking and even driving, has been smoother. A week's worth of harvested grapes can now be sorted overnight. The problem of over-shaking trees to the point of reducing their lifespan or even pulling them out of the ground can now be avoided as optical technology permits much gentler harvesting resulting in higher yields and longer tree life. Not only grapes and trees benefit from optical technology. Many of the tomato harvesters we've appraised-Commander, Johnson and Star NTD-have been being retrofitted with optical sorting equipment. It's great to see that some of the traditional shaker manufactures are still going strong and even expanding their offerings. Meanwhile, industry stalwart OMC has developed the FAST system (Fully Automated Shaker Technology), which takes the guess work out of tree shaker settings. Farmers now have the capability to program the shaking procedure tailored to individual specifications, providing farmer more control over the shaking process. Each tree is shaken with more consistency, allowing employees to work more efficiently. OMC has also expanded its manufacturing line. Primarily been known for nut tree shakers, they've added side-by-side stone fruit harvesters and a few years ago made the smart move of buying Wesco trailers, adding specialized nut hauling bottom dump bin trailer sets to the OMC line up. Nelson fabricates a number of products, including an optical orchard sprayer that turn sprayer valves on when it "sees" a tree. Tree recognition technology is orchards isn't new, but the Nelson One-Shot is purportedly remarkably inexpensive and easy to use. I'm particularly impressed with Nelson because in a recent buy/sell agricultural valuation for a buy/sell situation, I discovered that the fleet of Nelson seed harvesters-made over 20 years ago!-now sell for over twice what they sold for new. It helps that they had been rigorously maintained. Recently a firm out of Italy named Monchiero has begun manufacturing a combined sweeper / harvester that greatly reduces harvesting time and costs. 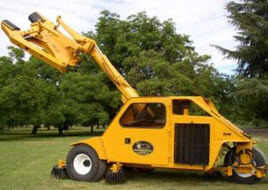 Porter tractor company out of Philomath, Oregon, has an 4wd articulating 127 hp low profile tractor designed especially for confined orchard spaces. 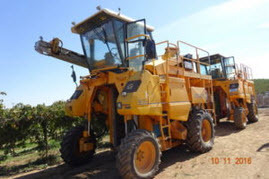 Then there is the world of mechanical grape harvesters made by firms like Gregiore, OXBO, Braud, and Pellenc. With the exception of OXBO, these are mostly foreign firms; however, their US headquarters tend to be in Northern California where the majority of their market is, so we still have a local connection! Nelson seed harvesterAlthough specialty harvest equipment for orchards and vineyards are used all over the US and the world, California's unique growing conditions support a high density of these equipment types. The main market for this equipment, and much of the manufacturing, is right on our door step, giving us an edge in appraising these speciality items that are mostly traded at the private party level, leaving no obvious public records for comparative sales. Due to our extensive network of contacts within the industry, we are able to provide defensible valuations of vineyard and orchard equipment for a broad variety of intended uses such as divorces, business combinations, bankruptcy, estate and gift. If you need values for speciality agricultural equipment, I hope you'll call us first. It's what we do. And who we know.